Yeti Casino: Ideal for Slot Game Lovers? 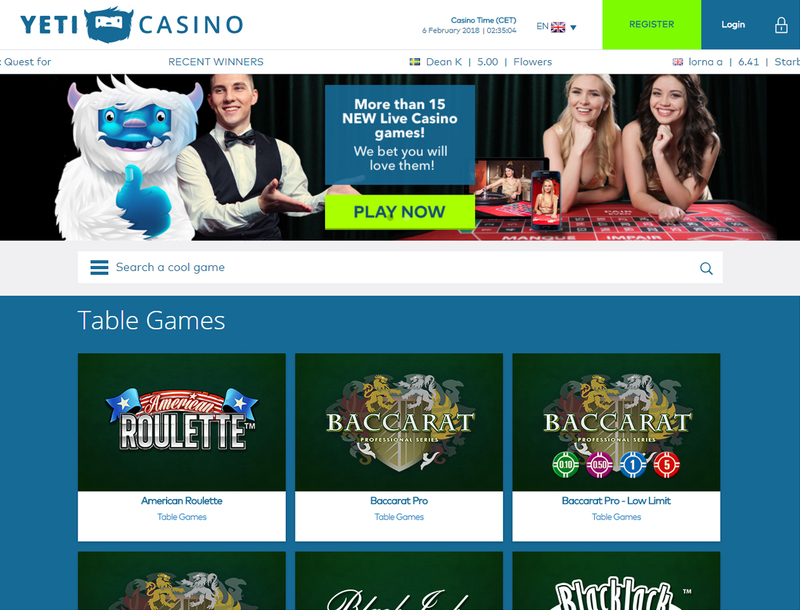 Yeti Casino has been operational since 2017; it may not be the oldest casino but it is among the few gaming portals that can give you a player experience as satisfying as what older casinos provide. It offers high-quality games, quick transactions, excellent customer support, and a mobile-friendly website. Plus, this betting site has licenses from the Malta Gaming Authority and the UK Gambling Commission, so you can play with peace of mind. But is it the ideal casino for slot game lovers? It may surprise you to know that this casino has few bonuses. The main incentives you get are a welcome package and cashback. Only a few countries, however, are eligible for the bonuses. That is why before choosing a bonus, be sure to read the conditions carefully. Here are the rewards you can find on this betting site. Register for an account with Yeti Casino and you will get 23 free spins even before you make your first deposit. To qualify for the 100% welcome bonus up to €333, you need to deposit at least €10. Then you can get an additional set of 77 free spins. If you want to withdraw your bonus money, you need to wager it 40 times within 30 days. Enjoy your Saturdays by getting up to 10% cashback without betting requirements. Keep in mind that you have to deposit at least €50 to qualify. This cashback promo is unlimited, so you always have a chance to get some money back. The amount you get depends on all the deposits you have made between 0:00 to 23:59 CET and on whether or not all the deposited money has been lost. If you are a registered member of Yeti Casino, you can receive Yeti Points. These points are the online casino’s version of comp points. Each time you deposit €20, you earn two points. When you have enough Yeti Points, you can exchange it for extra money. But to begin redeeming comp points, you need to have a cash balance of less than €10 and have 50 points. To top it off, you lose two Yeti Points for every €20 withdrawal. It is best to use these points only when you are having an unlucky day. This online casino collaborates with top-quality game providers such as NetEnt and Microgaming to give you an impressive game selection. You get over 450 slots, table games, and live casino games to choose from with high-quality graphics and fun in-game bonuses. You are sure to find slot games that are just as good as Bitcoin slots. Some of the titles you can play are Immortal Romance, Thunderstruck 2, and Twin Spin. These games have 243 pay lines, giving you more chances to get huge wins. Unlike regular slot games, jackpot slots do not have fixed top6 prizes. Instead, each time you and other players make a bet, the jackpot just gets bigger. Yeti Casino has an exclusive category for these jackpot games. Play Tunzamunni, Mega Fortune, or Mega Moolah, and see if you can get a life-changing win. If you like playing table games, you will find different versions of poker, blackjack, and roulette in this casino. You can also play Baccarat Pro, Punto Banco, and Pontoon Pro-Low Limit. 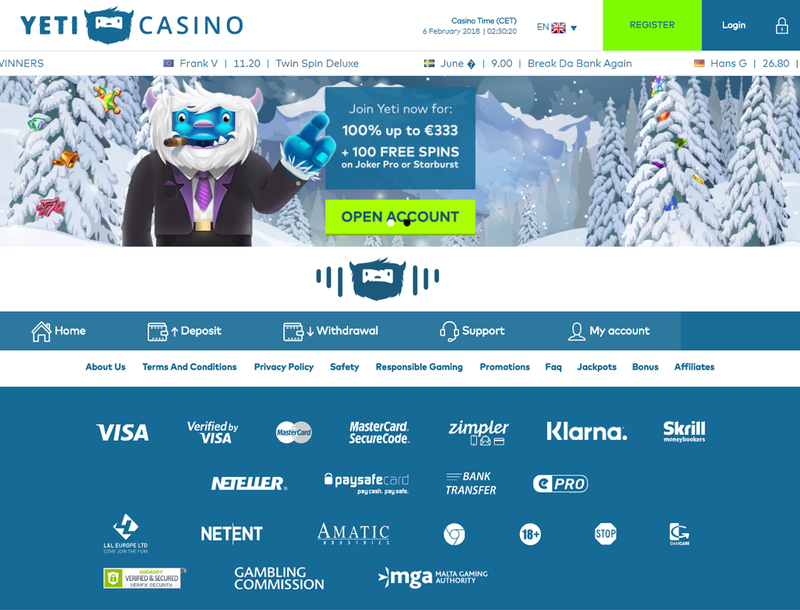 Yeti Casino accepts nine currencies including EUR, NOK, and CHF. It also supports several payment methods like paysafecard, ecoPayz, and Skrill. This casino strives to give you quick transaction times so you can start playing immediately. When it comes to deposits, you have various options. 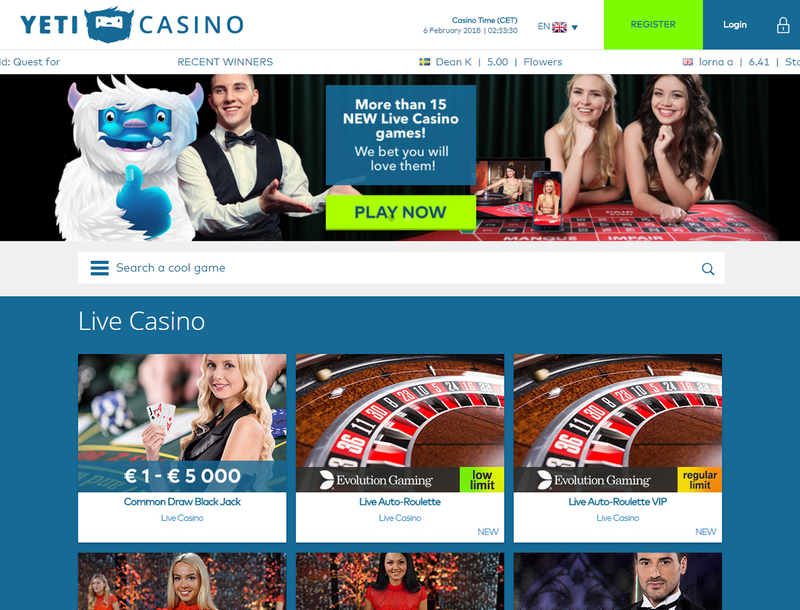 After registering for an account with this casino, you can deposit at least €30 through bank transfer or a minimum of €10 via other methods listed below. There are no service fees in this casino. However, do check if your chosen payment method will charge you with transaction fees. If you are used to playing slots with bitcoins, know this casino does not accept the digital currency yet. What you can do is use your Neteller account to deposit bitcoins and then use it to fund your Yeti Casino account. The daily withdrawal limit in this casino is €5,000. If you choose bank transfer to cash out your winnings, it can take two days for the transfer to complete. If you request a withdrawal of €2,300 for the first time, you may need to present a scanned copy of your legal documents. This is to confirm your identity and to ensure that your winnings are going to the right person. 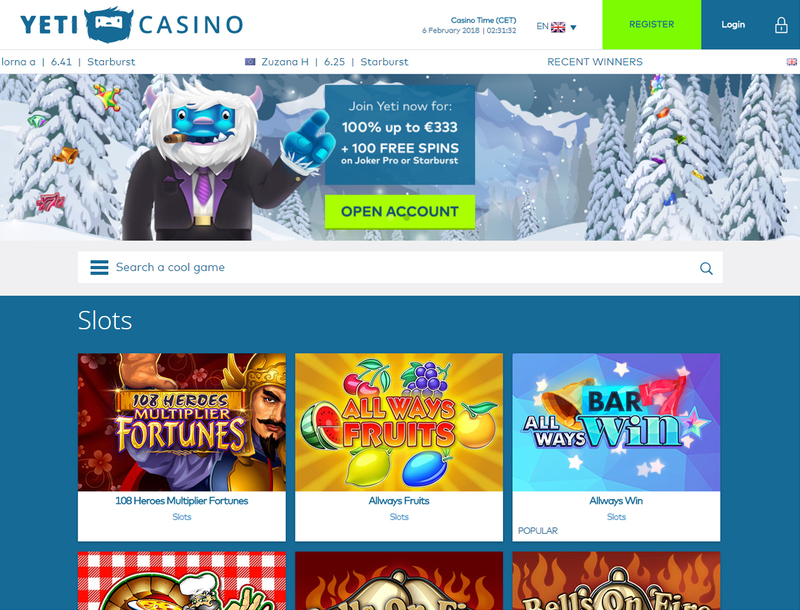 If you are searching for a casino that offers free spins on your first deposit, Yeti Casino may be what you are looking for. More so, it is one of the gaming portals that let you use comp points, known here as Yeti Points, to make up for your unlucky days. However, it would be nice if this online gaming hub had more information about its VIP program. The most information about loyalty rewards is on the Bonus page, and it is vague at best. This alone makes it difficult to determine if playing in this casino and reaching the VIP ranks are all worth it. On the other hand, this online casino knows how to draw in players. You get more than 450 games to choose from and you get a good-sized welcome bonus. This casino also offers several payment options and aims to give its players quick transaction times. While this betting site is lacking in rewards, you do get unlimited cashback every Saturday. Overall, this casino is still a good choice for slot game players who may or may not be used to playing Bitcoin slots. For more info about the brand, you may contact Yeti’s support team via the live chat option.